Abstract: This paper presents an easy-to-use and flexible approach for data collection supporting the ABET-CAC accreditation cycle. This approach to accreditation requires program objectives, program outcomes and continuous improvement. ABET-CAC accreditation requires continuous improvement between accreditation visits. Closing the loop on Outcome-Based Assessment is a challenging and difficult problem for faculty and institutions seeking accreditation. The paper presents a description of other outcomes-based Management Systems, both internally developed and commercially available, and proposes an easy way of integrating existing ABET-CAC templates into a coherent system. The system adapts the Blackboard Learning Suite for Outcomes Assessment. 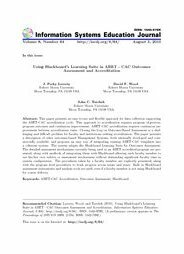 The detailed assessment mechanisms currently being used in an ABET accredited program are presented, along with methods of integrating them with Blackboard allowing each faculty member to use his/her own rubrics or assessment mechanisms without demanding significant faculty time in system configuration. The procedures taken by a faculty member are explicitly presented, along with the program level procedures to track progress across terms and years. Built in Blackboard assessment instruments and analysis tools are used, even if a faculty member is not using Blackboard for course delivery.